Born to Leopoldo Tarallo and Concetta Borriello, Maria was raised in a pious family, and received a Christian education. She made a private vow of virginity at age five in front of a statue of the Blessed Mother. Made her First Communion at age 7, and received Confirmation at 10. Feeling drawn to religious life, at 22 she wanted to enter a convent, but her family opposed it, hoping she would marry; however, the young man who had proposed to her died before the wedding. She then entered the monastery of the Sisters Crucified Adorers of the Eucharist in Barra, Italy on 1 June 1891, taking the name Sister Maria of the Passion. Spiritual student of the Servant of God Maria Rosa Notari. Served as novice mistress and as spiritual guide to her sisters, worked in the kitchen and laundry, and as porter. Known for her life of charity, deep prayer, and devotion to her Congregation and the Eucharist. Son of Priscus. May have been related to Emperor Valentinian. May have worked with Saint Ambrose of Milan. Deacon in Rome, Italy in 416. Almost nothing else is known about Celestine before his unanimous election as 43rd pope. Ordered the bishops of Vienne and Narbonne in Gaul to correct doctrinal errors and abuses. He sent Saint Germanus of Auxerre to Britain to oppose Pelagianism in 429, and later wrote a treatise himself against semi-Pelagianism. Opposed the Manichaeans, Donatists, Noviatians whose heresies were spreading. Convened a council in Rome in 430, sent legates to the General Council of Ephesus in 431 to condemn Nestorianism, excommunicated Nestorius and deposed him. Dispatched Palladius to evangelize Ireland in 431. Friend of and correspondent with Saint Augustine of Hippo; their letters indicate that Rome was the final authority for theology in the 5th century. Restored the basilica of Saint Mary Travestere after it had been damaged in Alaric's sack of Rome. He worked to reform the clergy of Gaul, and ordered that absolution should never be denied to the dying who were sincere in their repentance. Christian physician to emperor Maximian. Life-long layman and bachelor. At one point he abandoned his faith, and fell in with a worldly and idolatrous crowd. However, he was eventually overcome with grief, and with the help of the priest Hermolaus, he returned to the Church. Brought his father to the faith. Gave his fortune to the poor, treated them medically, and never charged. Some of his cures were miraculous, being accomplished by prayer. Denounced to the anti-Christian authorities by other doctors during the persections of Diocletian. At trial he offered a contest to see whose prayers would cure the incurable - his or the pagan priests'. The pagans failed to help the man, a palsied paralytic, but Pantaleon cured the man by mentioning the name Jesus. Many of the witnesses converted. The authorities tried to bribe him to denounce the faith, but failed. They then threatened him; that failed. They followed up the threats with torture. When that failed, he was executed. Martyr. One of the Fourteen Holy Helpers. Son of a poor shepherd, and worked as a shepherd as a child. A would-be monk at age 13, he was turned away from monasteries because his severe self-imposed penances. Tired of the gossip and arguments from fellow religious, he lived as a hermit on top of a column, occasionally preaching to those who gathered to watch and pray with him, and starting a movement of pillar-living among Eastern hermits. 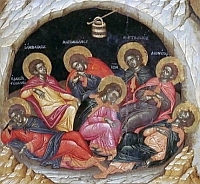 A group of seven young Christian men who hid in a cave in hopes of avoiding the persecution of Decius in the year 250. Found and arrested, they were ordered by the pro-consul in Ephesus to renounce their faith; they refused, and were sentenced to die. Legend says that they were walled up in their hiding cave, guarded by the dog Al Rakim; when the cave wall was breached in 479 - they all woke up! It is likely that the youths were tortured to death in various ways and buried in the cave. The resurrection story confusion came from the phrase "went to sleep in the Lord" which was used to describe the death of Christians, and 479 is when their relics were discovered. Their names were Constantinus, Dionysius, Joannes, Malchus, Martinianus, Maximianus and Serapion. Son of a craftsman. Layman cobbler who led a dissolute life in his youth and early married life. However, a serious illness at age 24 caused him to re-evaluate his life; he had a conversion experience, repented his early life, and dedicated himself to God, penance and prayer. He became a Franciscan tertiary, and converted his wife to an active faith. His charity to the poor nearly ruined his business. Pilgrim to many holy sites, and made the pilgrimage to Santiago de Compostela eleven times. Widower. Franciscan lay brother. 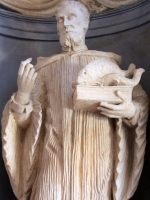 Camaldolese hermit at the monastery of San Maglorio in Faenza, Italy where his reputation for piety and wisdom continued to grow. Protestant minister; rector of Lutterworth, Leicestershire, England in 1571. Convert to Catholicism, led to the faith by his younger brother William who became a Jesuit priest. With his younger brother Abraham, he studied in Douai, France in 1576. Ordained in February 1577 for the apostolic vicariate of England. Robert returned to England on 19 March 1578 to minister to covert Catholics during the persecutions of Elizabeth I. Imprisoned and martyred for the crime of priesthood. Born to the Italian nobility. Her mother died while Mary was five months old; the lack of a mother affected the girl deeply, and led her to intense religious devotion and prayer. At age 18 she joined the Capuchin Poor Clares of Santa Maria della Neve in Brescia, Italy. Professed in 1706, she spent the rest of her life in the convent. Recognized in the convent for her holiness and prayer life. Twice prioress, and served several years as novice mistress. Worked to promote devotion to Christ Crucified, and used her own example to encourage penance and personal sacrifice for the Lord. Lay woman in Moorish controlled ninth-century Spain. Married to Saint Felix of Cordoba. A covert Christian who was careful not to display enough of her faith to risk the attention of Muslim neighbors. However, stories of the persecutions of active Christians shamed her into openly living his faith. Martyred in the persecutions of Caliph Abderraham II. Born to the nobility. Benedictine monk at the Abbey of Saint Blaise in the Black Forest in Germany. Priest. Prior of Gottweig Abbey in 1107. Developed and served as first abbot of Garsden Abbey in 1111. Introduced the Hirsau Reforms into Austria. Known for his strict adherence to the Benedictine Rule, charity to the poor, and endless work as a spiritual director to visitors and the laity. Entered the novitiate of the Friars Minor Conventual at the Franciscan convent at Granollers, Spain as a teenager in 1929. Studied at the seminary in Osimo, Italy where he was ordained in 1934. His short career as a parish priest in Granollers was noted for his preaching and devotion to the confessional. Captured, beaten and martyred in the Spanish Civil War for the offense of being a priest. Born to a wealthy Moorish father, Spanish mother, and orphaned as a child. Raised as a secret Christian by his aunt during the Moorish occupation of Spain and persecution of Christians. Married a half-Moorish woman who was born as Sabigotho, changed her name to Natalia when she converted to Christianity, and is a saint as well. Father of two children. Publicly proclaimed his faith after seeing a local merchant named John scourged to death for being a Christian. Both he and Natalia were martyred in the persecutions of Caliph Abderrahman II for openly practising their faith. He early felt a call to the priesthood, and was ordained in the archdiocese of Valencia, Spain in 1920. Parish priest in Quatretondeta, Spain; priest and co-adjutor in Ibi, Spain. Martyred in the Spanish Civil War by Republican forces. Priest in the apostolic vicariate of England during a period of government persecution of Catholics. Martyred for the crime of being a priest. His final act was to pray for the people who attended his execution. Half-Moorish. Convert to Christianity. Married to Saint Aurelius. Mother of two. She and Aurelius knew that to openly practice their faith was a recipe for martyrdom. However, after making provision for their children's welfare, they became openly Christian, caring for the sick and poor, and talking openly about Jesus. Martyr. Joined the Salesians in 1930. Teacher in Ciudadela, Spain. Began his studies for the priesthood in Madrid, Spain. Martyred in the Spanish Civil War. Ursuline nun. Martyred in the persecutions of the Nazis. Blood sister of Saint Semproniana of Mataró. Baptized by and spiritual student of Saint Cugat del Valles. Nun. Imprisoned and martyred in the persecutions of Diocletian for trying to bury the martyred body of Saint Cugat. Member of the Salesians, making his final vows in 1932. Attended the canonization recognition of Saint John Bosco. Teacher. Co-adjutor of his Order. Martyred in the Spanish Civil War. Blood sister of Saint Juliana of Mataró. Baptized by and spiritual student of Saint Cugat del Valles. Nun. Imprisoned and martyred in the persecutions of Diocletian for trying to bury the martyred body of Saint Cugat. Sixth century bishop of Lescar in the French Pyrenees. Participated in the Council of Agde. Martyred by invading Arian Visigoths led by Alaric. Sister of Blessed John of Rieti. Augustinian nun at Amelia where she became prioress. Joined the Salesians in 1930. Teacher in Sarria, Spain. Martyred in the Spanish Civil War. Claretian priest. Martyred in the religious persecutions of the Spanish Civil War. Martyred in the persecutions of Dhu Nowas (Dunawan), King of the Hymerites along with a large number of fellow Christians whose names have not come down to us. Monk from Palestine. Deacon. Arrested and condemned to death during the persecutions of Caliph Abderrahman II. He was offered a pardon as a foreigner, but he declined, perferring to stand for his faith, minister to his fellow prisoners, and die as a martyr. Spiritual student of Saint Peter the Apostle. Assigned by Peter as the first Bishop of Bisceglia, Italy. Martyred in the persecutions of Trajan. Bishop of Ravenna, Italy from 521 till his death in 532. Built the Basilica of San Vitale. 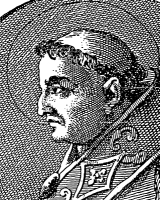 Worked with Pope John I to resist King Theodoric. Layman Christian in Moorish-occupied Spain. Married to Saint Lillian of Cordoba. Martyred in the persecutions of Caliph Abderraham II. Eighth-century nun. Tortured and exiled from Constantinople for refusing to comply with the heresy of iconoclasm. Priest in Nicomedia, Bithynia, Asia Minor (modern Izmit, Turkey). In his old age, he converted Saint Pantaleon, then the imperial physician. Martyr. Sixth-century bishop of Auxerre, France for 10 years. 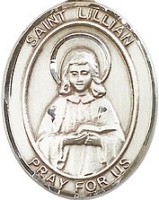 Titular saint of Kill-Luicain parish, County Roscommon, Ireland. No details have survived. Three Christians martyred together. The only other information to survive are their names - Felix, Jucunda and Julia.